This was the week that the strawberry gods bestowed upon me a bumper crop of berries. So many strawberries – not enough ideas. 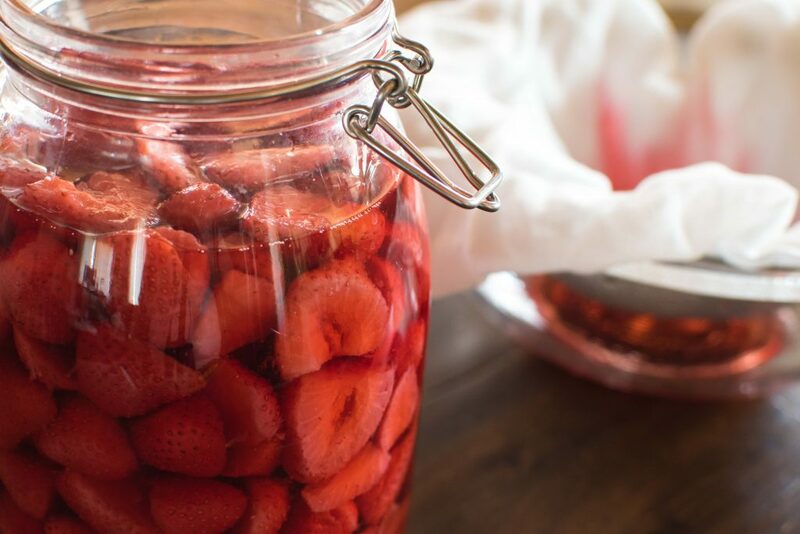 I asked around for recipes, and my friend Beth from Lifestyle for Real Life said: “Make strawberry infused vodka.” Um, yes, ok, great idea, glad I asked. I mean, when someone presents you with a great idea, you roll with it right? She always has the best ideas. Infusing vodka isn’t hard. All you need to do is find your fruit, fill a jar and pour vodka over the top. Couldn’t be simpler. But there are a few tips and tricks to get a perfect end product. 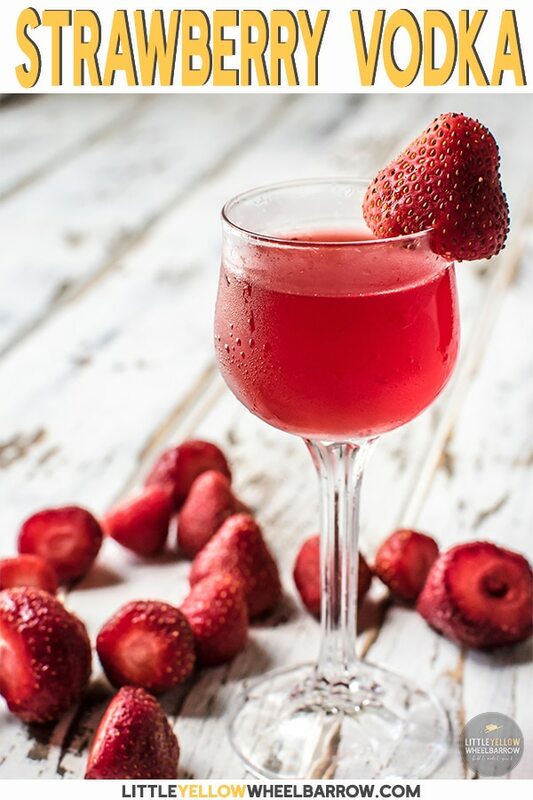 This alcohol will taste like real strawberries if you do it up right. No artificial flavors here and that is why this infused vodka is far superior to anything you could buy in the store. What fruit to use for your vodka infusion? The first thing is to start with fresh, ripened fruit. The fresher the fruit, the better tasting the final results. If you start with over or under-ripe fruit, your vodka will pick up weird tastes. Your result will not taste at all like fresh summer strawberries (or blueberries, or cherries, or anything you want). Also, don’t skimp. Use LOTS of fresh berries. 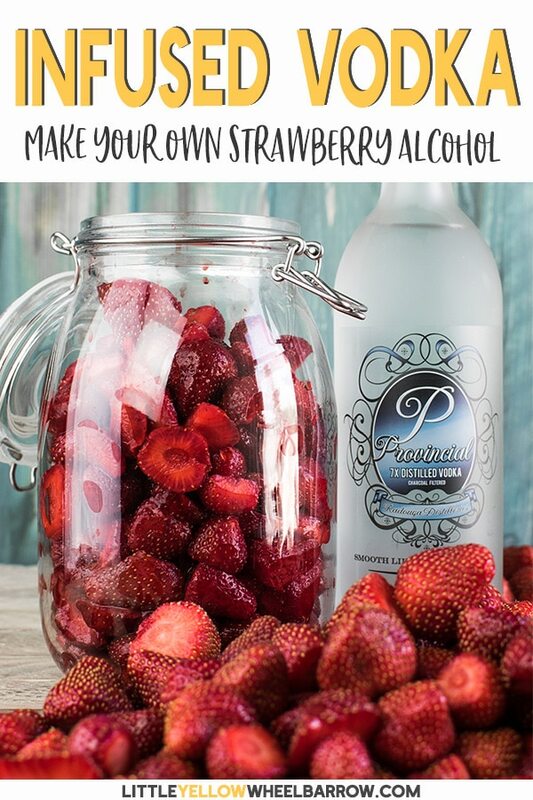 I had so many fresh strawberries I didn’t know what to do with them so sacrificing a quart or two for a strawberry infused vodka was perfectly OK in my books. 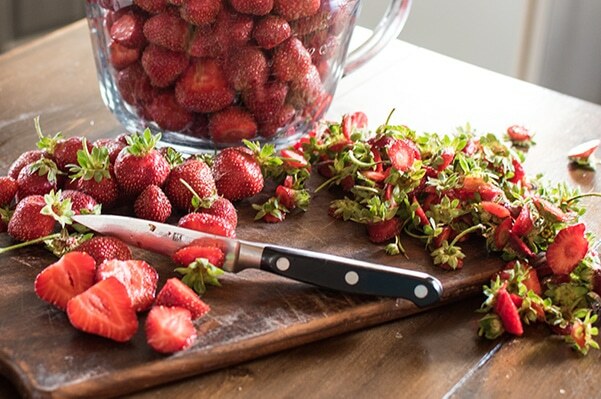 Prepare your berries with a quick wash under cold water. Pat dry, remove the tops and cut into quarters. I used a 2-quart jar and filled it to the top with sliced berries. It was about six over-full cups. The trick here is to not skimp on the berries. I’ve seen recipes offer up a cup of strawberries per quart of alcohol. 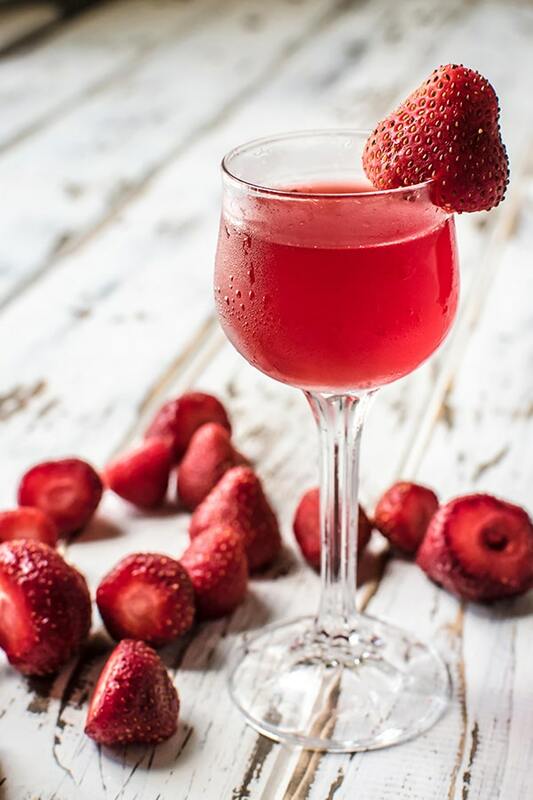 Forget that jazz – you want a vodka that has a serious punch of fresh summer strawberry. 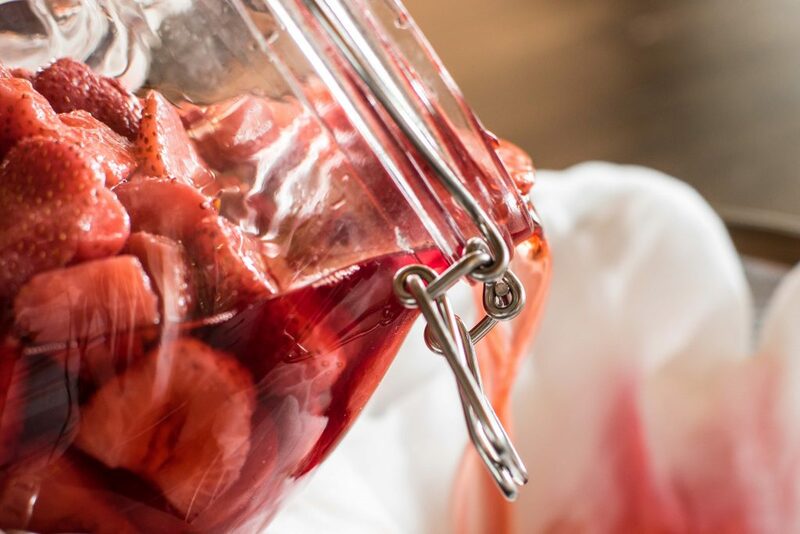 What’s the best type of vodka to use for your strawberry infusion? Choose your vodka wisely. Cheap alcohol will yield a cheap tasting strawberry infused vodka, but you know you probably do not want to pull down a bottle of grey goose for this either. I choose a clean tasting, well-filtered vodka, that had a sweet fresh taste. Wasn’t the cheapest bottle, and wasn’t the most expensive. Or, use whatever vodka you like to drink because that will work just as well. Pour your vodka over your berries, so they are fully submerged. Leave the bottle on the counter, and start the waiting game. Poke at the bottle every day, give it a shake, see what’s happening. 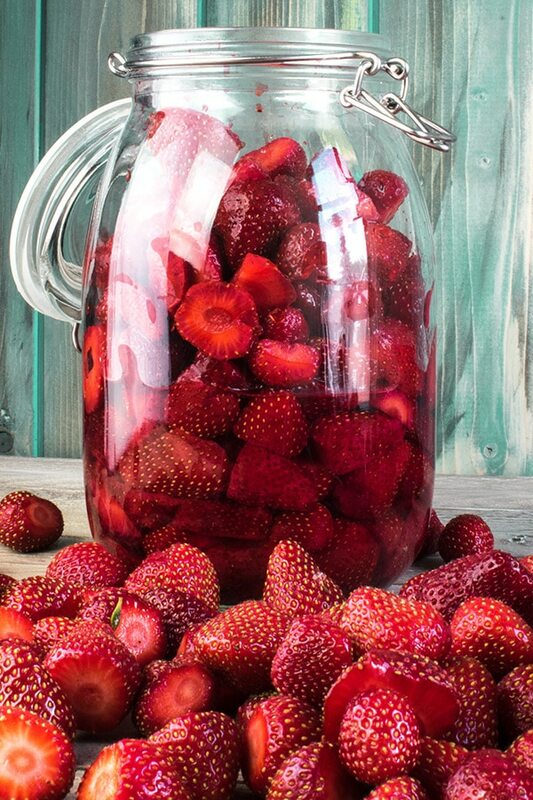 In about three days your strawberry infused vodka will be ready. Sugar? No sugar? What about the sugar? If you want your cocktails, or drinks to be sweet, you can add your sweetener while making your drink. Simple syrup works best because it’s not grainy. I don’t quite understand adding sugar. If you want liquor, go ahead and add as much sugar as you want. I want an infused vodka, no sugar, just flavor. Eventually, your beautifully bright red berries will start to look a bit washed out and unappealing. At this point, it’s time to prepare your vodka. Strain it over cheesecloth and a fine mesh strainer. We want to remove all the seeds, pulp, and any flesh to create a bright ruby red liquid. See how red the strawberry infused vodka gets when you use lots of fresh berries? Isn’t that a beautiful sight? Your vodka will last six months, covered, inside of your refrigerator. 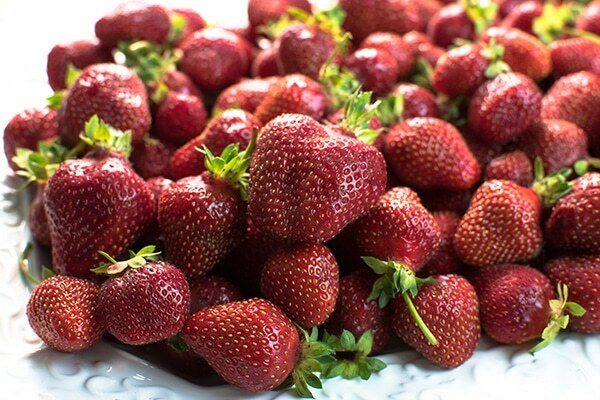 As far as the remaining strawberries go, toss them. They are quite unappetizing at this point as all the luscious berry flavor has transferred from the pulp to the vodka. 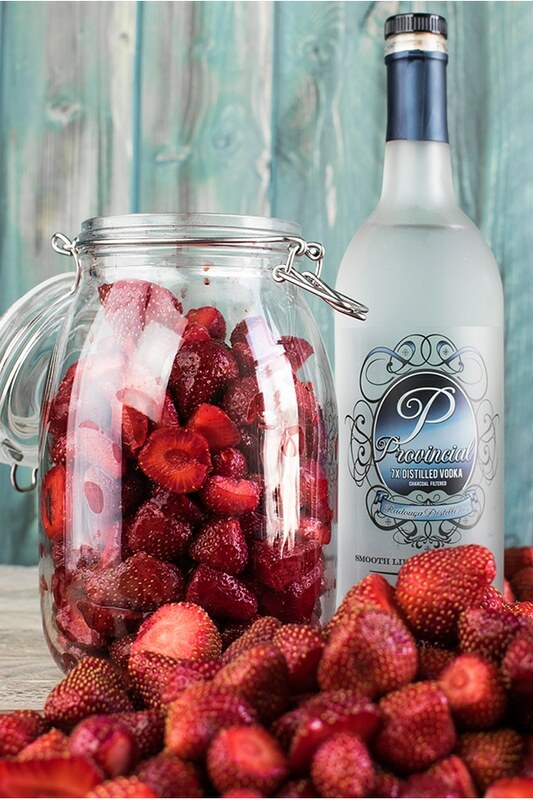 You can freeze your strawberry infused vodka if you want to keep it around longer. It does not stay in its liquid state but turns into a sweet slush. Not at all a bad thing if you want to make some adult slurpies. No seriously, make some adult slurpies!